So, I know I’m now among the many bloggers, news anchors, and college students to talk about I’m Shmacked, but how could you not? How did you make your college decision? Or for those of you still in high school, how are you deciding on which college to attend? Of course you want to think about how academically stimulating the environment is (at least make sure your parents think that its a part of your criteria), the enrollment, and maybe the geographical landscape of the campus, but how about the social scene? I’m Shmacked is making social life more relevant than its ever been before in the realm of college decisions. On their Twitter page you can see countless retweets of kids saying they’re choosing which college to attend based off of how insane their I’m Shmacked feature is. In one video, two college students from Ireland state that they specifically chose The Louisiana State University because of the I’m Shmacked video they saw for it. That, my friends, is being influential. 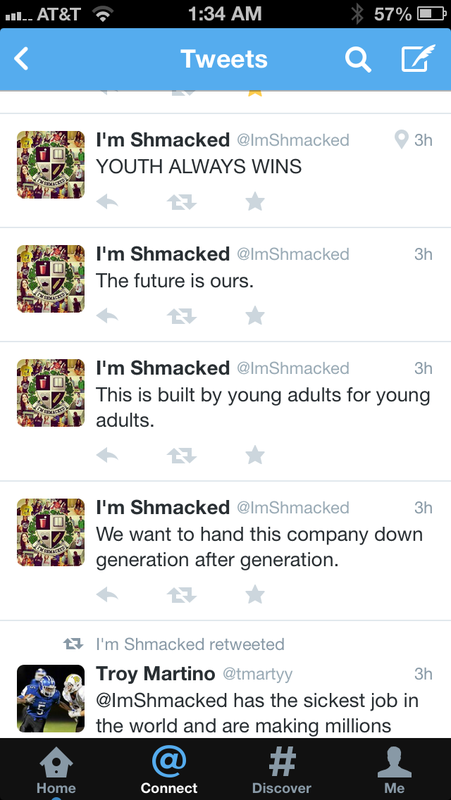 You see, I’m Shmacked is extremely marketable and cool right now. If you’re a college administrator denouncing the I’m Shmacked crew from hosting a party on your campus, well, you’re clearly a buffoon. Recently valued at $5 million after their first round of drumming up venture capital, I’m Shmacked legitimately provides something that University admissions officers cannot: the coolness factor. Venture Capitalists and investors see the potential in this brand; I don’t understand why administrators have to be so backwards. 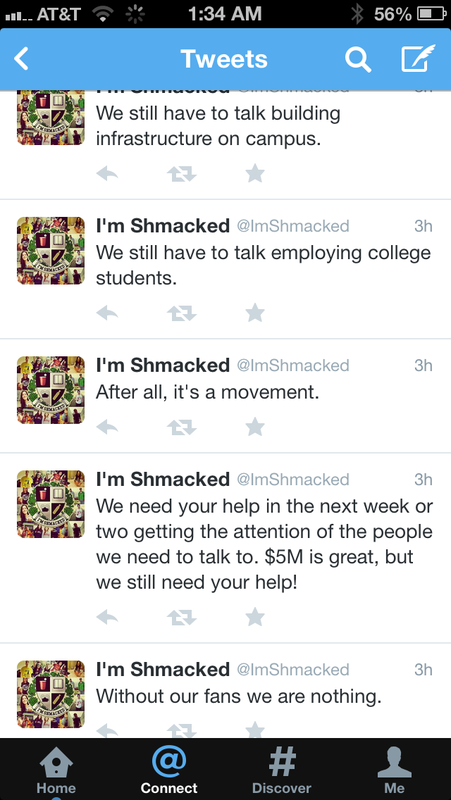 Your schools are popular because of I’m Shmacked! What more could you want? Yes, I’m Shmacked has been receiving negative publicity in the news because of their controversial videos, but among the people who truly matter, the droves of college students buying tickets to their parties, I’m Shmacked is extremely relatable and primed to make a large profit. Think about the licensing deals that could spawn from their brand and even possible TV shows or movies. Who wouldn’t want to relive their glory days by watching Dave Franco and Jennifer Lawrence do ridiculously illegal and sexual things that are only acceptable for four special years of your life? One can only dream, hell, I’m Shmacked. With my question still percolating within my mind, I decided to look through Nike’s 2012 Annual Report for more information. Two years ago, Nike brought in over $13 billion in revenue from their footwear sector of the company, a 15% increase from 2011’s fiscal year end. In fact, over the past three years Nike has seen a steady increase in their revenue from the footwear department. According to the report, Nike credits this increase to a low single digit percentage increase in average selling price per pair of shoes; a double digit percentage growth in unit sales; an increase in demand for performance products, such as the Nike Free and Lunar technologies, which can be found in a lot of their running shoes; and an increase in sales of the Nike Running, Basketball, and Sportswear lines of the company. Raise your hand if you own a pair of Nikes…I thought so. In economics there is this principle called elasticity where changing an economic variable, such as price, quantity or income, affects other variables on a scale from inelastic to elastic. I want to focus on inelastic goods, regarding footwear, because Nike’s annual report indicates inelasticity of demand. With inelastic goods price and revenue move in the same direction, which means if the price of the good increases so will total revenue, and vice versa. In Nike’s report, they stated that they saw an increase in revenue for footwear because of a low single digit percentage increase in average selling price. This suggests that Nike knew their product and consumers (the sneakerheads) well enough to understand that their footwear is inelastic and that a slight spike in prices would not hurt revenue. As forecasted, Nike yielded increased sales, which is exactly why they later revealed a double-digit percentage growth in unit sales for the year. Furthermore, Nike also claimed that there was a revenue increase in footwear due to a spike in demand for their new running technologies and specific shoe lines within the company. What type of shoes do you see released in limited quantities? Well, its certainly not Nike’s football or soccer cleats, no, that would be impractical! Instead, we see limited pairs of shoes from the Nike Running, Nike Basketball, and Nike Sportswear lines, which also utilize Nike’s latest footwear technologies (Nike FREE and Nike Lunar). This is because these are the styles that are popular beyond the sports world. 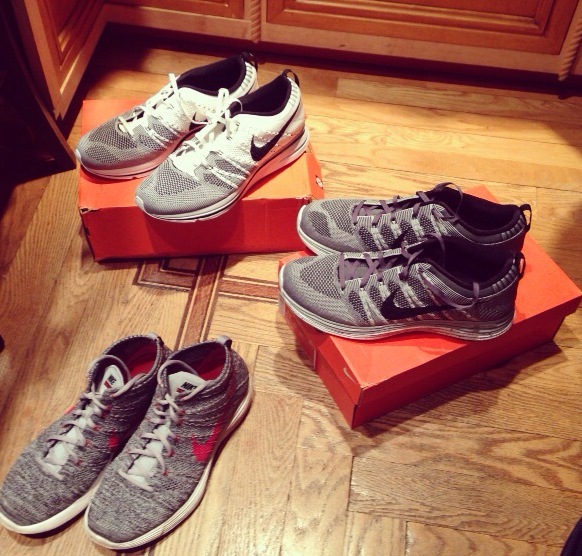 Kids and young adults are wearing these products for everyday use; no longer are the days where sneakers are solely used for athletic purposes, it’s a fashion statement to rock Nike’s Flyknit Trainers (my personal favorite) to school or on errands. Nike has taken note and exploited these trends in their releases, which is why they’ve seen augmented revenue margins. Making sense a little bit? At the end of the day though, I think Nike, and other sportswear companies, utilize this limited release tool for reasons that go beyond economic or financial principles. Since Nike doesn’t produce at an efficient level where marginal cost equals marginal benefit, there must be some outlying factor that reaffirms this action. I believe it is marketing. Nike remains a part of our cultural fabric because of their ability to stay relevant, creating a buzz and reputation around their brand. With their athletes (e.g. Michael Jordan, Lebron James, and Serena Williams), commercials, and slogans people are consistently talking about Nike and their iconic status. Limited releases are Nike’s newest tool to combat the ever-wandering mouths of public consumption. The people who are able to buy the limited edition shoes feel special because of the rarity of their purchase and the little company they share. Those who are unable to purchase the shoes, on the other hand, either obsess over upcoming Nike releases or end up buying another sneaker with their allocated money that was originally designated for those special kicks. It’s a win-win situation for Nike, as they not only increase their revenue stream, but the buzz around the company is perpetuated by those obsessive followers of The Swoosh who just want to feel unique too! You saw in the video (found in Part I) what kind of shoe collecting people are doing nowadays, now multiply that by the millions of teenagers and adults who are also trying to create their own sneaker collection…pure genius by the gentleman behind The Swoosh. This completes the Nike chapter of Young Economics. Thank you for taking the time to read my material. Be sure to check out all three parts and let me know what you think!